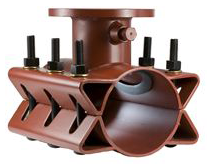 The JCM 412 Fabricated Carbon Steel Tapping Sleeve is an idea low cost solution for waterworks, applications from 6.00" to 30.00" diameters with carbon steel flanged outlets from 3.00" to 12.00". They have options including Epoxy Coat body and bolts and Epoxy Coat body and S/S bolts. The 412 Series is rated to 175 psi and to 212 Degrees F.